Authorized Wholesale Dealer of a wide range of products which include bow shackles. 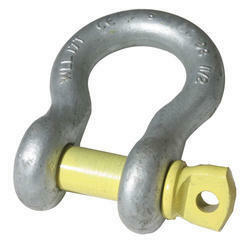 We have set a benchmark in the industry for wholesaling and trading Bow Shackles. The offered products are used for suspending cords while lifting heavy loads in coal mines and construction industries. They are remarkable in tensile strength and resistant to wear and tear. Our product range has been procured from reliable vendors for keeping in compliance with the industrial standards. Looking for Bow Shackles ?